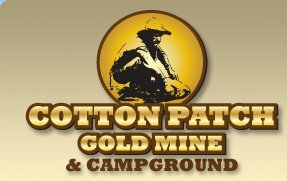 Cotton Patch Gold Mine & Campground is a private mine that is open to the public on a fee basis. We have some simple rules we ask our guests to follow..for the safety of all. Please let us know if you encounter any problems. We want your stay to be a safe and fun experience. NO ONE ALLOWED in MINING AREA!!! We can't stress how important this is. The mining areas are for employees of Cotton Patch. For safety reasons, we ask that you obey all warning signs and do not cross any caution taped areas. When entering the mine you must obey all speed limit signs. The speed throughout the mine is 5 MPH. We ask everyone to follow the speed limit for the safety of you and others. We do allow responsible riders on bicycles. All children must be supervised and not allowed to roam property unattended. Make sure your child knows there is no rock throwing! Quiet Time is between 10:00 pm and 7:00 am. This means respect other campers and no loud noise, such as TV, talking, laughing, music, etc. No alcoholic beverages allowed off of your camp-site. Any alcoholic beverages must be in covered containers at campsites. No alcoholic beverages allowed at creek. NO GLASS BOTTLES!!!! Anyone who becomes intoxicated will be asked to leave or to go inside their camper or tent. Do not leave campfires unattended and use only designated fire ring. No loud cursing or obscene language. All campsites must be kept clean and all trash put in DUMPSTER. Well behaved animals on a leash are welcome, owner must clean up after them and keep animals with THEM at all times. If you can't clean up after your dog you aren't welcome! You are responsible for your pet and its actions. DO NOT leave your dog unattended at your campsite. NO open firearms or shooting on premises. NO DIGGING OR METAL DETECTING allowed anywhere on property. Do not damage any property or cut down trees. Cutting down trees is a BIG NO-NO! No erection of buildings, structures, and/or street lights is permitted without prior written approval from management. All panning material remains on premises unless purchased as take home material. You may take home your black sand concentrates. FAILURE TO COMPLY WITH THE ABOVE RULES WILL RESULT IN IMMEDIATE REMOVAL FROM THE PREMISES! Campground management reserves the right to change rules and regulations at any time. There will be no refunds given for any of the above violations.